January 23, 2013 January 23, 2013 Nefer Khepri, Ph. D.
One of my lovely Facebook friends, Pepi, has begun a daily Lenormand Challenge at her blog: Mystic DePepi. I am going to try to participate daily and post my answers to Pepi’s challenge questions to my blog. The card to get me started will be the Rider, in some decks is known as the Cavalier. from the self-published Brittas Wahrsagekarten Lenormand. 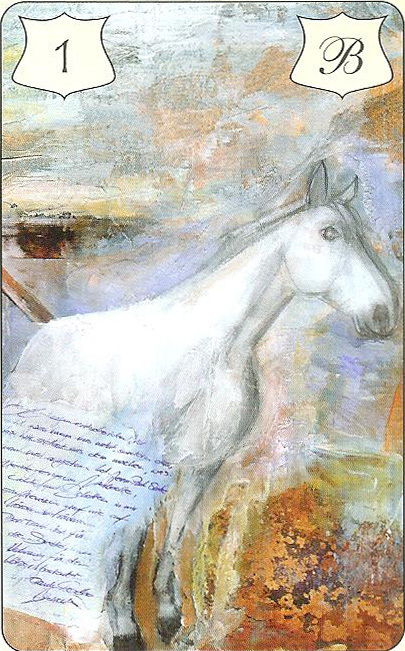 The Rider represents someone bringing a message, usually of the written variety on paper, but not always. The Rider can also represent a young man who is athletic. The Rider begins my journey with the 30-Day Lenormand Challenge. 1. How did you end up into the world of the Lenormand? Well, for me the journey was a bit convoluted. One of my aunts was very spiritual, but she always attempted to keep it well hidden from other family members. While staying with her one summer visiting the branch of my family that lives in central California I woke up one morning to find her seated at her dining room table. She had all these cards out on the table in front of her. She was bent over the cards concentrating and muttering to herself. I got her attention and asked her what the cards were. At the time I was already reading tarot and she was well aware of this. I could see pictures and names on the cards; such as, Bouquet, Clover, and Sun. However, these cards were much smaller than tarot cards, and the deck only consisted of 36 cards. My aunt explained to me it was a French method of divination named after a famous reader (Madame Lenormand) who had once read for Napoleon and his wife, Josephine. That immediately caught my full attention. At the time I was in graduate school studying for my master’s degree. As a result, I had very little time for non-academic interests. However, I did purchase a deck and began playing with the cards as my sparse spare time permitted. However, the guide book was very brief and only contained one spread (The Grand Tableau) that uses all 36 cards. That was too daunting a task for me since the largest tarot spread I was doing at the time was the astrological spread with 13 cards. So I set that Lenormand deck aside for 23 years. Over a year ago I joined a Facebook group, the Lenormand Cards Study Group, and it is there I began to learn reading methods for my little Lenormand deck that had been languishing in my huge card collection for over two decades. I caught on to the reading method relatively quickly for two reasons: 1) I am a Gemini and LOVE to learn new things; and 2) I was becoming a bit burnt out on the tarot. I needed a new tool to re-spark my intuition and that is just what the Lenormand has accomplished for me. Now my tarot readings are going in new directions and I find the information for readings comes even easier to me than before while I have also been doing Lenormand readings and now offer them for sale at my site. The Lenormand has opened up a whole new world of divination to me and it is now allowing me to offer my clients a whole new method of reading that is very different from the world of tarot. I love reading the Lenormand. The readings are always very clear, concise, and incredibly accurate. I owe a debt of gratitude to the Lenormand Cards Study Group for putting my feet on the correct path, providing a great deal of guidance, and for also introducing me to a world of self-published Lenormand decks. I now am the proud owner of 15 Lenormand decks, and don’t even ask me how many tarot decks I own (last count it was over 100! ).